If you have yet to notice, we have somewhat of an obsession with bathrooms. From the latest trends to the broad spectrum of vibrant hues that inspire a refresh, we’re constantly on the lookout for the creative ways in which we can upgrade the decoratively versatile room–and given the endless stream of ideas out there, we’re never short of them either. One particular design trend on the rise comes in the form of a creative paint detail that promises a statement-worthy finish you can easily replicate at home. A two-tone approach is taken to the wall paint, paired with an equally alluring tile design that complements the tonal properties of the space. Ahead, a peek at a handful of beautifully designed bathrooms, which emulate the trend with effortless elegance—and the design tips we will be stealing from each one. It’s not all about a basic two-tone scheme with this trend. Don’t be afraid to think outside the box—take a decorative cue from this visually-stunning spot, where the paint is cleverly extended onto the ceiling, resulting in an all-encompassing finish that clearly makes a statement. In lieu of a standard gridded tile, a complementary color detail is introduced to provide a dynamic layer atop an otherwise basic concept. Be still, our design-loving hearts. 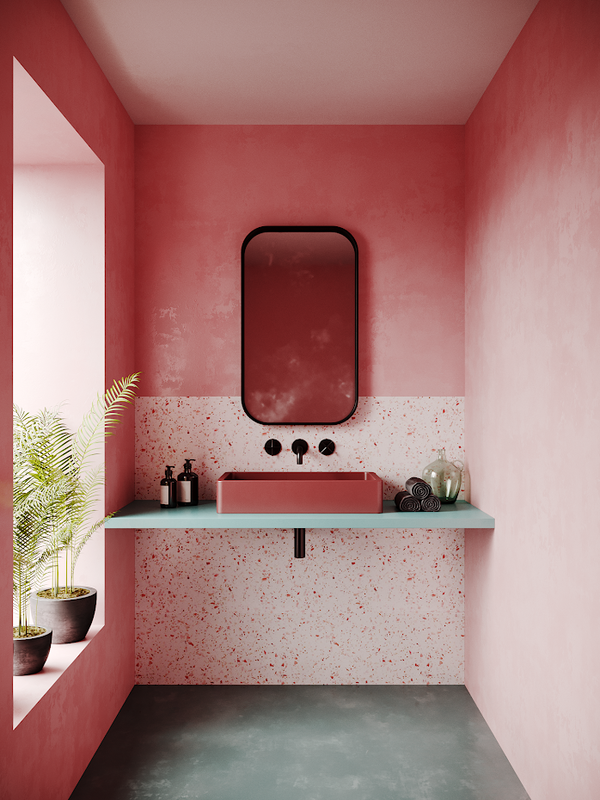 The saturated depth of the pink wall paint undoubtedly goes on to steal the spotlight in this dreamy bath but it’s the combination of the terrazzo tiling and baby-blue vanity top that takes things to the next level. Aside from inviting a subtle hint of contrast to the room, the soothing hue helps further establish the vanity as the focal point of the room. Matte black details by way of the fixtures and mirror invite an element of depth that completes the space. While there is no shortage of vibrant prints and patterns in this colorful bathroom, it’s the diagonal color-block behind the vanity that instantly captures the eye. Paired with a modest handful of furnishings and fixtures, the saturated use of color invites a major dose of personality to the space. While the trend has made itself evident in the form of a two-tone paint and tile color-block, we’re definitely here for an update that comes with an additional tile detail. In this bold and bright bath, a saturated burst of serene blues impart the light-filled room with a soothing effect, courtesy of the eccentric mix of patterned and subway tiling. Embrace a geometric approach to the look, allowing the decorative theme to extend to more than just the fixtures. Restrict subway tiles to the bottom half of the room—extending it along the entirety of the room, the shower included, for a cohesive finish—and designate a bold hue for the top half of the room. In this ultra-modern bathroom, a paneled wall of mirrors contributes to the theme of the space, all the while helping establish a visually-rich effect. We’re calling floor-to-ceiling tiling as the next big trend in bathrooms and this spot certainly proves our prediction. And while we’re used to seeing the trend play out within the entirety of the room, this yin and yang-inspired take on it not only results in a clever rendition of the look but it also makes for one seriously stunning finish. Aside from the high-contrast color scheme, it’s the gridded tiling that imparts the room with a major dose of style and personality. An intricately-patterned tile can result in an overly busy feel, which one would likely avoid when working within tight quarters. Instead of having to give up on your preferred pick, designate the tile for the lower half of the bathroom—making sure to extend it along all four corners of the room—and pair the pattern with a wall paint that draws on one of the prominent hues found within the motif.